I LOVE the colors of this image. Talk about an interesting photo that just jumps off the screen at you! Nicely done. What sort of critter is he? 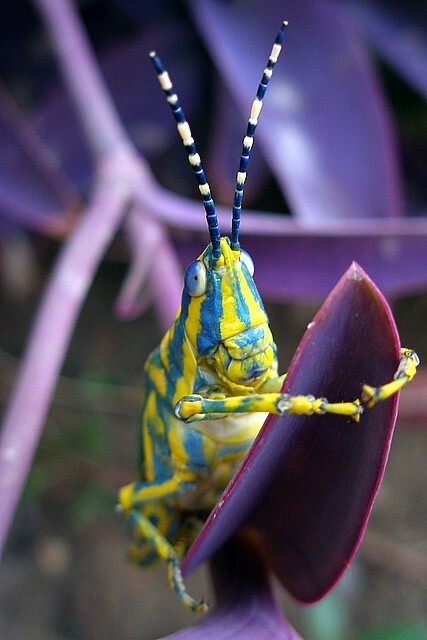 Looks like a grasshopper that lost a fight with a paint can. This is the better one of the four....and just beautiful colours. This one is my favorite (not necessarily going by bokeh but just the pictures themselves). I LOVE the colors! You have the honor of being one of the very few, if not the only, bug favorites of mine! Proudly hosted by Sargasso Networks. Current Server Time: 04/25/2019 07:49:12 AM EDT.